Need some quick bling for your Christmas mantle? 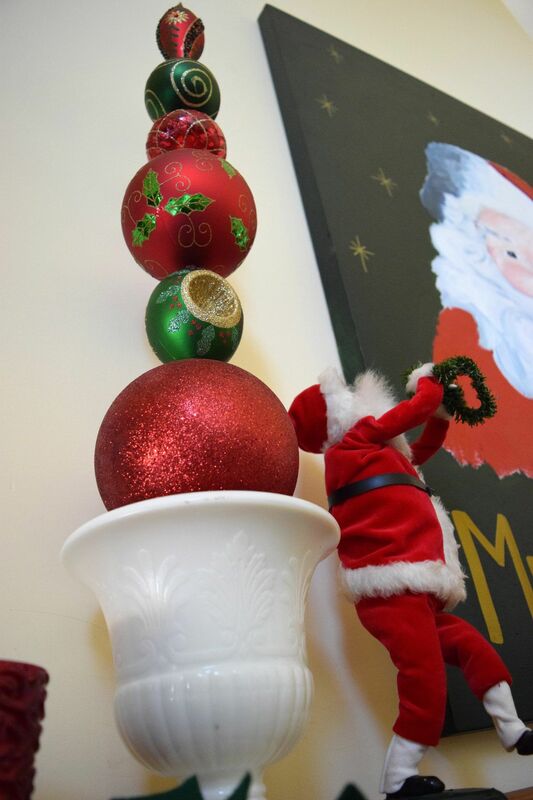 These ornament topiaries are quick to make and inexpensive relative to the impact they make! I don't know about your family, but in ours, there are 2 GUARANTEED debates that will occur every Thanksgiving and Christmas in my family. Debate #1 : When is the best time to buy and put up our Christmas tree (which then leads to decorating the rest of the house)? ? My logic (which is faultless, of course) is that its best to buy the tree as soon as they arrive on the lot and get them home and in water. Terry thinks its best to wait a bit to get a fresher one closer to Christmas! First of all, I think all the trees are cut around the same time, before Thanksgiving, so you won't be getting a fresher one if you wait, you'll just be getting one who hasn't had the benefit of sitting in water for a couple of weeks. Luckily, I usually prevail on this debate. Debate #2 : What is the right way to count down your advent calendar? My kids and I believe the calendar should count down showing how many days are left until Christmas, but Terry thinks you start at #1 on the first day of December. In Terry's defense, our advent calendar, which is a family treasure lovingly made by my mom, has the '25' at the top of the tree. Terry thinks that when you reach the top of the tree, it should be Christmas. I understand what he's saying, but it's a family joke/fun debate each year and each year the ornaments on the tree get re-arranged depending on the belief of the person placing the countdown ornaments. So, I have a couple of weeks before I have to gird myself for these debates; but since I know I will ultimately win #1, in a short 2 weeks we will be putting up our tree and decorating our home for Christmas. I have even more quills in my quiver this year as Kate will be home from school for the Thanksgiving break and decorating for Christmas is one of her most favorite things and high on her list of things to do over her long weekend home. 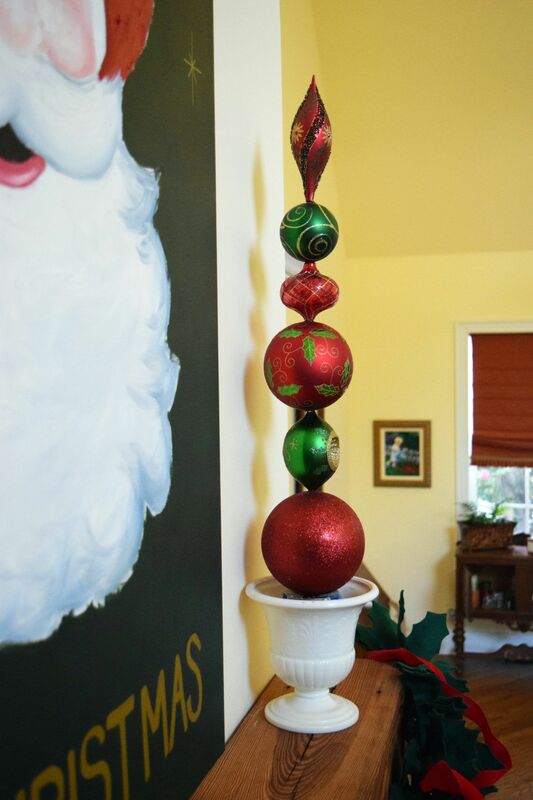 My topiaries are 27″ tall, from the bottom of bottom ornament to the top of the top ornament. The supplies listed will make topiaries approximately that size. Plastic ornaments of differing shapes, sizes and decoration, I used a total of 6 ornaments for each topiary. 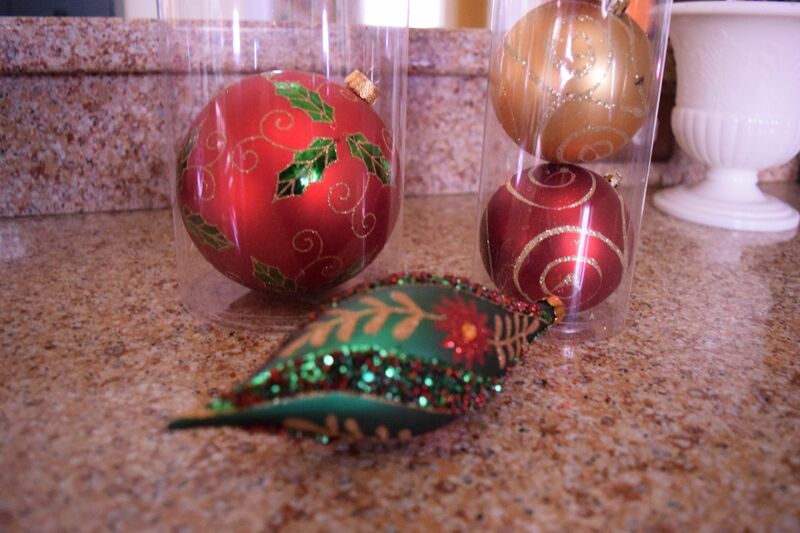 The next biggest ornament is 4″ in diameter. The remaining 3 are approximately 3″, give or take. Plaster of Paris. I used 4LB Plaster Of Paris. I used 1/2 of the 4lb container for both topiaries. Mark, to the best of your ability, the top of your ornament with a pencil or pen. 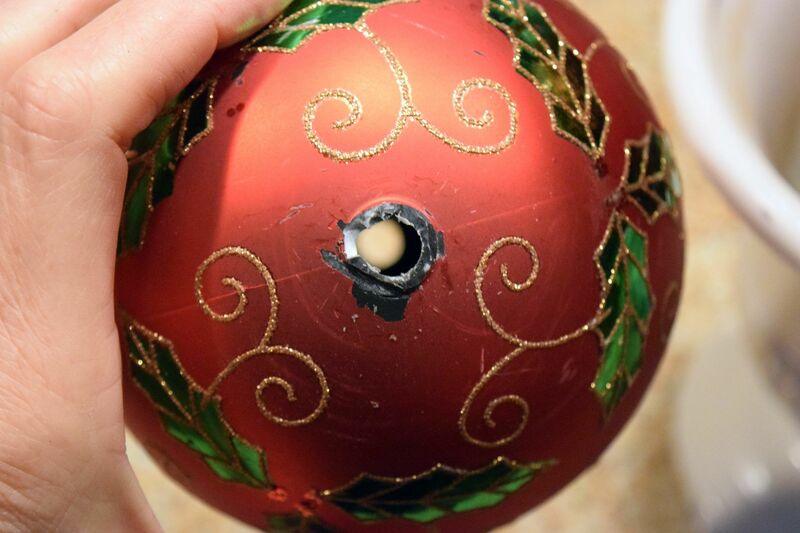 I put the dowel in the bottom once I remove gold hanger part and bumped it on the top of the ornament from inside and then just felt where it was bumping and put my mark there. If your ornament has a little nib where the gold hanger part went, I found it easier to clip those away with the wire cutters. Some just cut right off, while others I rather ‘nibbled away on' with the wire cutters. Once I got as much off with the wire cutters, I used my drill bit to ‘sand' the rough edges down and make it as flush as possible to the ornament. I'm sure the Tool Gods are trembling with how I was using the drill, but a girl's got to do what a girl's got to do. And it worked just fine and no tools were hurt during the filming. Now comes the fun part…drilling the holes. I needed something to hold the ornaments while I drilled them. While walking to the garage pondering this dilemna I spied a pot of dirt that the sad remains of a begonia occupied. Here we go again…Crafting Kismet! It worked perfectly! Sand would probably work better, but I just wiped the dirt off when I was done with the drilling. I used the smaller, 1/16″ drill bit first to make a ‘guide hole' otherwise the larger bit wanted to move around before it caught hold. That worked perfectly for me. 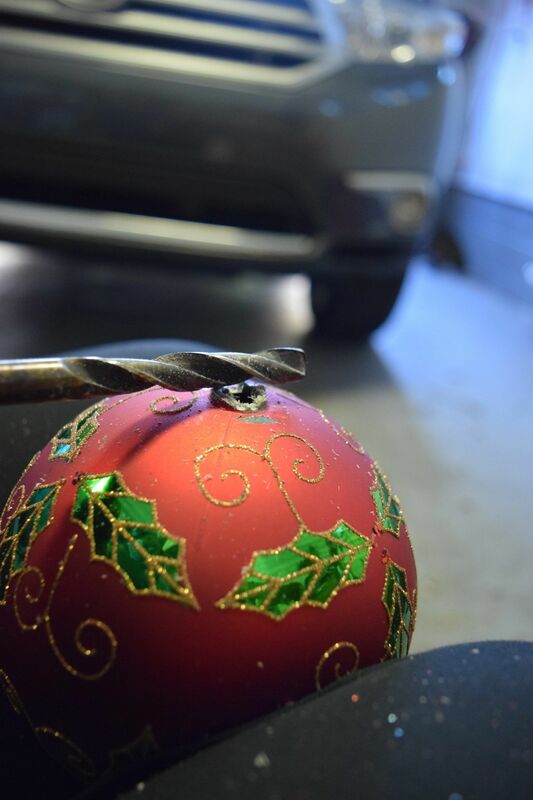 Once I drilled the smaller hole in each ornament, I followed up with the larger drill bit. I found that you want to go slow and not use too much pressure…just let the drill do the work slowly. 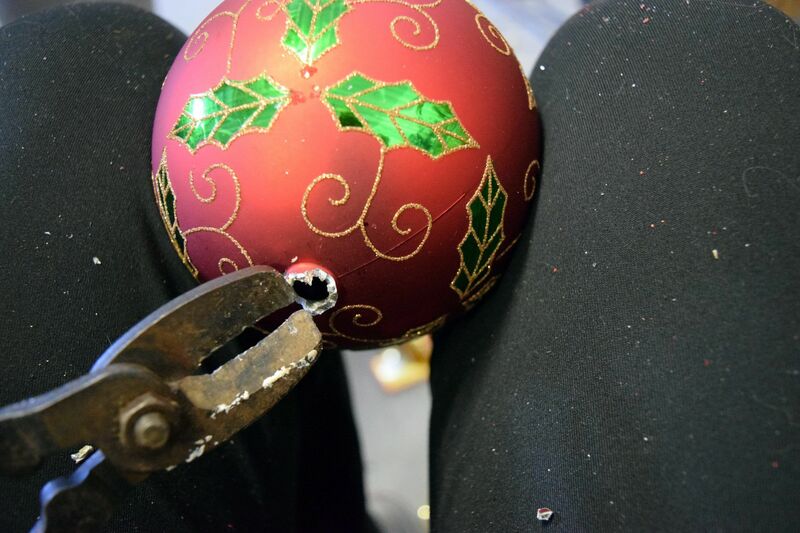 If the openings where the gold hanger was on each ornaments needed to bigger, I just worked my bigger drill bit into each of those openings. I practiced on some spare ornaments just to get the hang of what I needed to do, but I did not have one ornament crack! I was quite surprised. Once all the holes were drilled, I need to make my base pots. I used these cans which fit perfectly into my urns and filled them with plaster of paris according to the directions on the package. 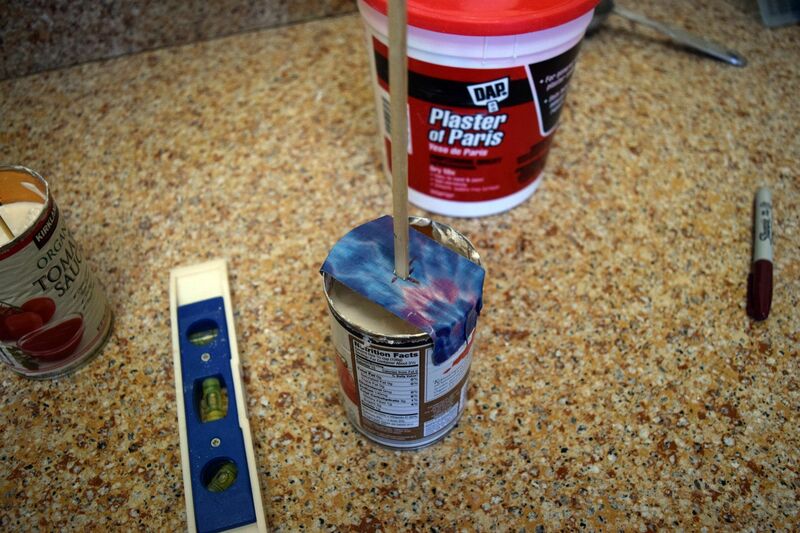 Once the plaster of paris began setting up, I placed my dowel in and used my level on a couple different sides to determine that it was straight. I checked every couple of minutes for about 20 minutes. I also placed the jar up against my cabinets…which I assume are perfectly straight and eye-checked them too. I placed the ornaments in a couple different configurations before I decided on this one. I did need to take about 4-5″ off of the top of each wood dowel after I placed all the ornaments on it. So now I just need to figure out the rest of my mantle in the next couple of weeks! Have you started your Christmas planning? Lynn, what a beautiful mantel decoration! The Santa Picture you painted is amazing! You are so good at it Lynn!!! Then, the topiaries made out of ornaments is just a brilliant idea! Wow, I love them left and right next to Santa! It gives the whole look a beautiful finish! Guten Morgen Katrin! Danke Schon for your kind comments. I’m quite tickled with Santa! Painted him on a whim and he came together quite well…meant to be…or Kismet! And the topiaries were fun and quick too…immediate gratification kind of project. Hmmm…so you do it the way Terry thinks it should be done! He’ll be glad to know that he’s not the only one! Have you figured out what little trinkets you will be putting in your advent calendar this year? i LOVE your santa painting! you are so talented! And have such a great eye. Beautiful topiaries, too! Aw thanks Jen! I’m pretty tickled with the Jolly Old Elf myself. Did him on a whim and was pleasantly surprised when I was done…which doesn’t always happen. I love how the ornaments look like they’re defying gravity. Very cool. 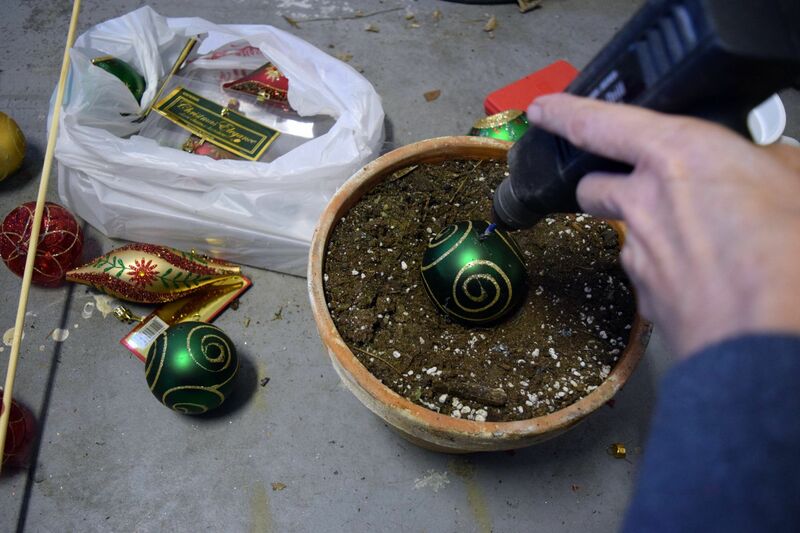 I love how you drilled the holes with the ornaments sitting in a pot of dirt. I never would have thought of that, but it’s a great idea to keep them from rolling away! Hi Vineta, thanks for stopping by and visiting. The pot of dirt was a spot on for doing what I needed it to do! Love when something works like you hope it will! These are awesome Lynn – just love this idea! Thanks for the easy to follow tutorial too. Thanks Marie! It was a fun and quick project. Preeeetty, I love all your decoration ideas, I literally ‘feel at home’ just looking at them! Thanks Mary! That’s such a nice compliment…that’s my goal. Hey Leilani, thanks for visiting…just returned from visiting your site. Man, you guys have done alot of work on your home! Well done! 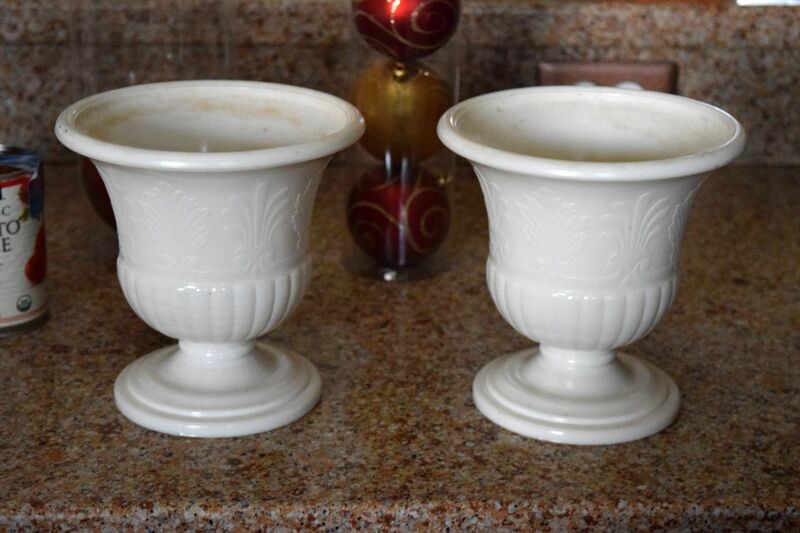 As it relates to storing the topiaries, you could do two things: Keep them on dowel in plaster of paris or slide them off the dowel and store them in a box until you need them again. Being plastic, they are fairly sturdy! Heck…I drilled holes in them and none of them cracked! My husband would LOVE to apply your momma’s logic…but he doesn’t have a chance! I think he’s truly acquiesced to my way, but would never admit it out loud. 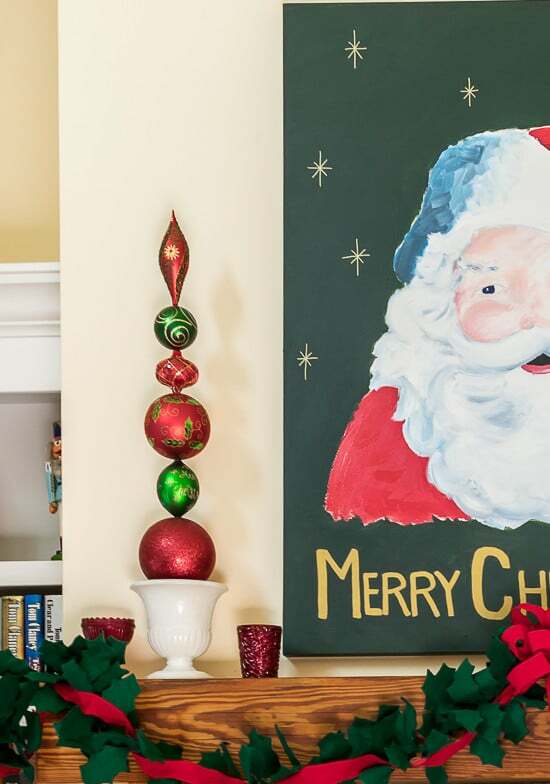 What a great way to add height to your mantel! Thanks Barb…did the trick perfectly. Lynn, I too am a collector of Santas and I must say that the canvas you painted is incredible, great job, so stylish and modern. Love it. Now, on to the topiaries, these are so cool. I have always loved the topiaries I see in the store, but they are always so pricey. A bit too much for me to justify for holiday decor. I love how you worked through that problem and created some gorgeous works of art for you mantle. These are the perfect height and they pull everything together. I can’t wait to see the rest of your decor. P.S. I am really impressed with your use of powertools! Love it! Thanks Nikki! I strongly encourage you to give the topiaries a try…much easier than I had anticipated and MUCH cheaper than those you see in the stores. We have one of the ‘pottery stores’ that seem to be all over the country and I was able to get most of the ornaments for around $1 each! The dowels cost of all $3 and the plaster of paris was inexpensive too. Given the impact, the cost was really nothing. And thanks for your compliments on my jolly old elf. I am really quite smitten with him, nice when something evolves how you hope it will. I do hope you are enjoying a good weekend in your part of the country! It’s a beautiful and crisp fall/winter day here in Coastal NC. As always, thanks for your kind comments Nikki! 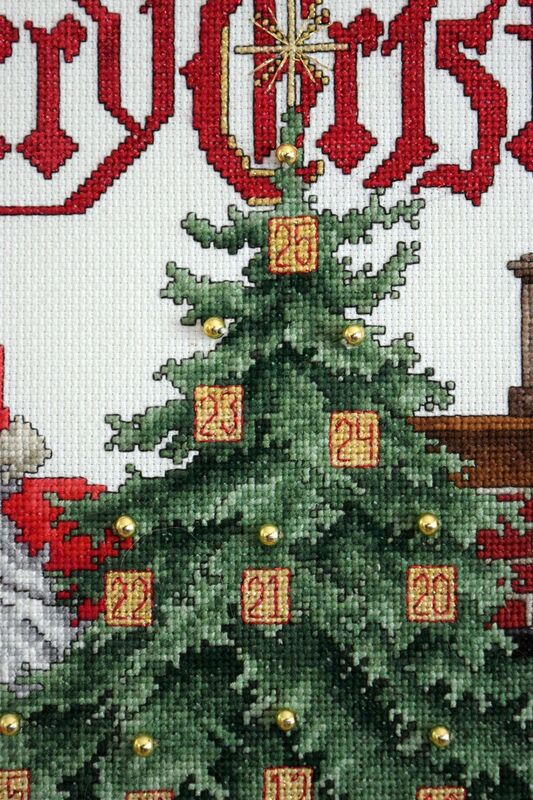 This is a great idea and I just love your advent calendar (whichever way you decide to start). So sweet that it was made by your Mom! Thanks Crystal! 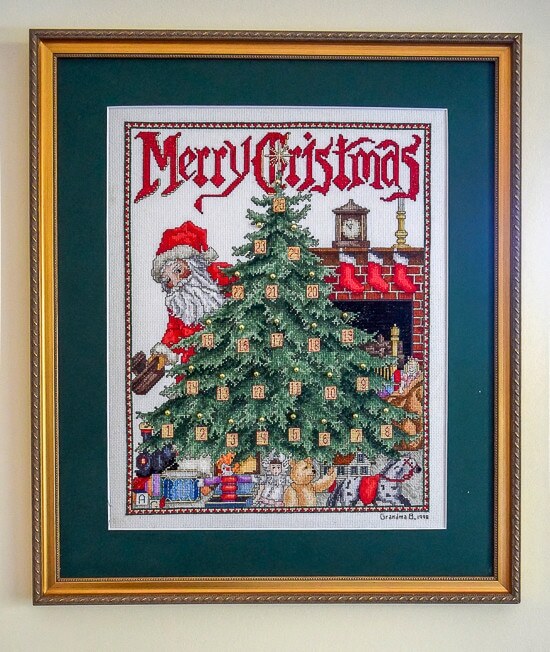 I do love the advent calendar my mom made…it is such a special piece of our Christmas decorations and traditions. BTW, just stopped by your site and read you r’My Favorite Things” post…what a great idea. These are great! 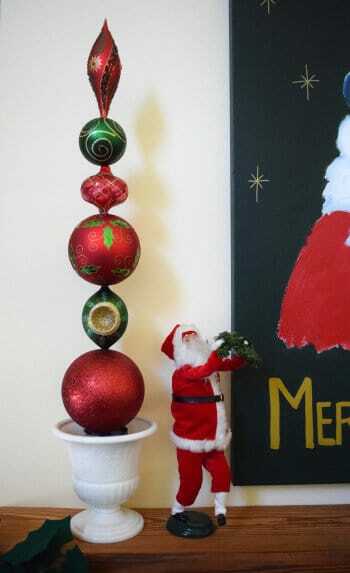 I love finding different ways to display ornaments. I agree with your husband on the advent calender debate. I’ve never heard of anyone opening the 25 first! Thanks Lisa…but seriously…you agree with my husband? But I’m always right!!! Anyway, thanks for visiting and have a very Merry Christmas. BTW…just have to tell you, given your love for Country music, that before we moved to North Carolina, we spent 10 great years in Nashville. The first songs my kids learned were Waylon Jennings songs, they knew Waylon’s house by sight AND we saw Keith Urban perform before he was Keith Urban. What a great town! Who are your favorite artists? Thank you for linking up to Your Inspired Design! We will be featuring your topiaries in this week’s linkup! Oh Thanks Gloria! I’m thrilled and will stop by for Thursday’s party! Wow, that’s Thanksgiving.